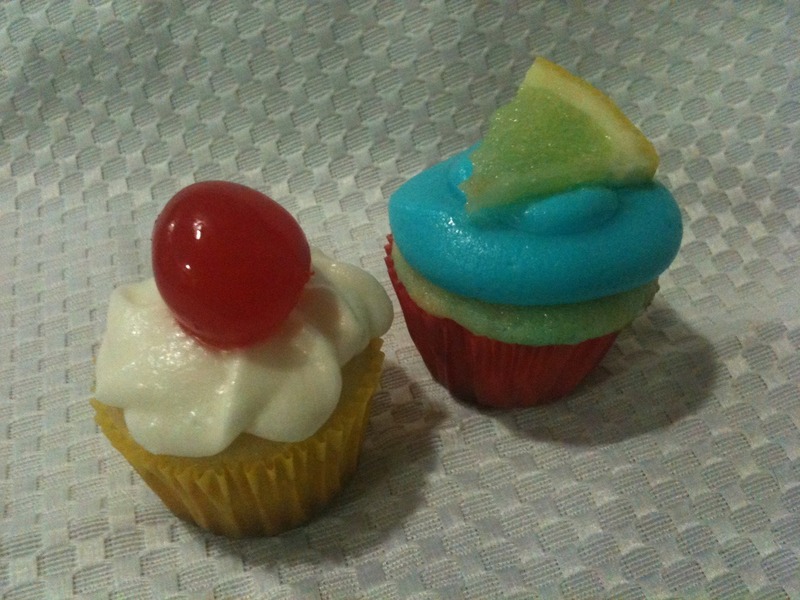 Make any hour Happy Hour with Amaretto Sour Cupcakes and Blue Lagoon Cupcakes. Amaretto Sour Cupcake – Made from a Lemon Lime cake recipe (substituting amaretto for the vanilla extract). Bake for 15 minutes (I made mini cupcakes). When cooled, pipe with your run of the mill buttercream but once again, subbing the vanilla with amaretto. Top with a maraschino cherry (this makes all the difference). Blue Lagoon Cupcake – Made from a Lemon cupcake recipe (any one will do but I did swap out milk with coconut milk). I set aside some of the batter and mixed in Blue Curacao. Once I’ve divided the batter into the cups, I spooned a little of the blue batter on top and swirled it with a toothpick. I also added Blue Curacao to the buttercream and added more blue icing tint to make the colour pop. Garnish cupcake with a small wedge of lemon dipped in sugar.